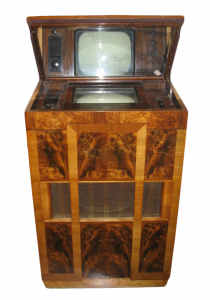 One of the original televisions offered for sale at the start of UK television service in 1936, the Marconi model 702 had such a long cathode-ray tube that it needed to be stood on end, and used a mirror to reflect the screen at viewers. Clever marketing sold this deficiency as a feature, claiming that the vertical orientation protected viewers from being showered with glass if the picture tube inadvertently “exploded” (CRTs actually implode when shattered, due to the vacuum inside) and that viewing via a mirror protected their eyes from damage from the “harmful” electrons! 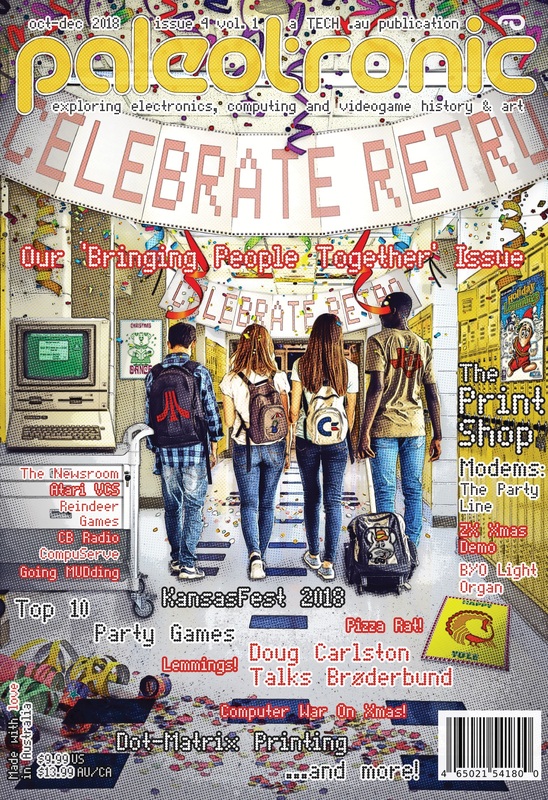 The CRT is masked by an overlay to crop the viewing area rectangular in shape, and make the experience more familiar to viewers used to the screen at the cinema. 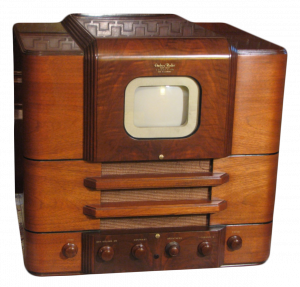 Over the next few years methods were developed to make the tubes less elongated, and by the end of the 1930s television sets with horizontally oriented CRTs became available. At the launch of US television service in 1939, the Andrea 1F5 was one of the first receivers available to Americans. 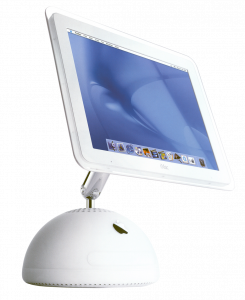 It was available fully assembled or as a kit, and launched at a price of US$137.50 (US$2400 in 2018) – not as pricey as the Marconi, but still not cheap. It used a 7 inch (18cm) in diameter RCA 7JP4 round picture tube like the one shown here – once cropped, you weren’t left with much of a screen! After television manufacturing resumed at the end of the second World War, some manufacturers (particularly Zenith) decided the circular shape of the tube wasn’t a bug but a feature, and began marketing “porthole” TVs that had the entire face of the tube exposed. However, despite concerted efforts to accustom them to the idea of a round screen, consumers found them strange (like something out of a science-fiction serial!) and manufacturers continued to press for the development of a rectangular picture tube. By 1950 one was successfully produced, and several manufacturers that year released new models that used it. It’s 1956 and time to get rid of that dusty old round-tube TV and buy yourself a brand-new rectangular set! Look at all that extra screen real-estate you get in the same-sized cabinet! Some manufacturers were so proud, in fact, they didn’t see any need to put their prized rectangular tubes in a cabinet at all, instead making them the focus of attention, and relegating the cabinet to second-class status, a mere stand for the tube to prop itself upon like a victorious Olympic athlete…okay, that might be selling it a bit too much. 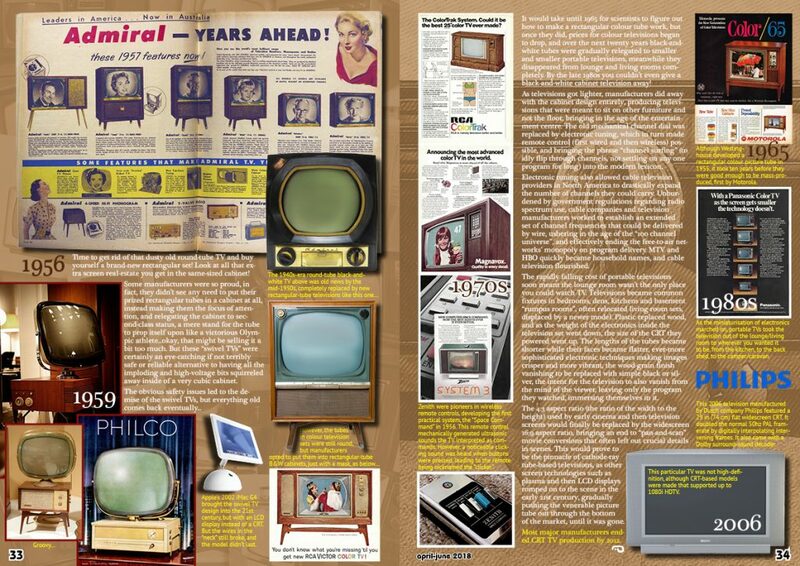 But these “swivel TVs” were certainly an eye-catching if not terribly safe or reliable alternative to having all the imploding and high-voltage bits squirreled away inside of a very cubic cabinet. 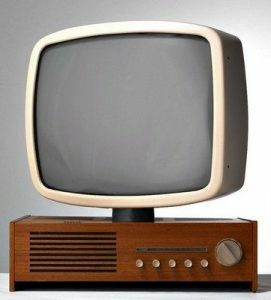 It would take until 1965 for scientists to figure out how to make a rectangular colour tube work, but once they did, prices for colour televisions began to drop, and over the next twenty years black-and-white tubes were gradually relegated to smaller and smaller portable televisions, meanwhile they disappeared from lounge and living rooms completely. 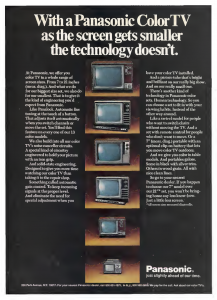 By the late 1980s you couldn’t even give a black-and-white cabinet television away! As televisions got lighter, manufacturers did away with the cabinet design entirely, producing televisions that were meant to sit on other furniture and not the floor, bringing in the age of the entertainment centre. The old mechanical channel dial was replaced by electronic tuning, which in turn made remote control (first wired and then wireless) possible, and bringing the phrase “channel surfing” (to idly flip through channels, not settling on any one program for long) into the modern lexicon. Electronic tuning also allowed cable television providers in North America to drastically expand the number of channels they could carry. Unburdened by government regulations regarding radio spectrum use, cable companies and television manufacturers worked to establish an extended set of channel frequencies that could be delivered by wire, ushering in the age of the “100 channel universe”, and effectively ending the free-to-air networks’ monopoly on program delivery. MTV and HBO quickly became household names, and cable television flourished. 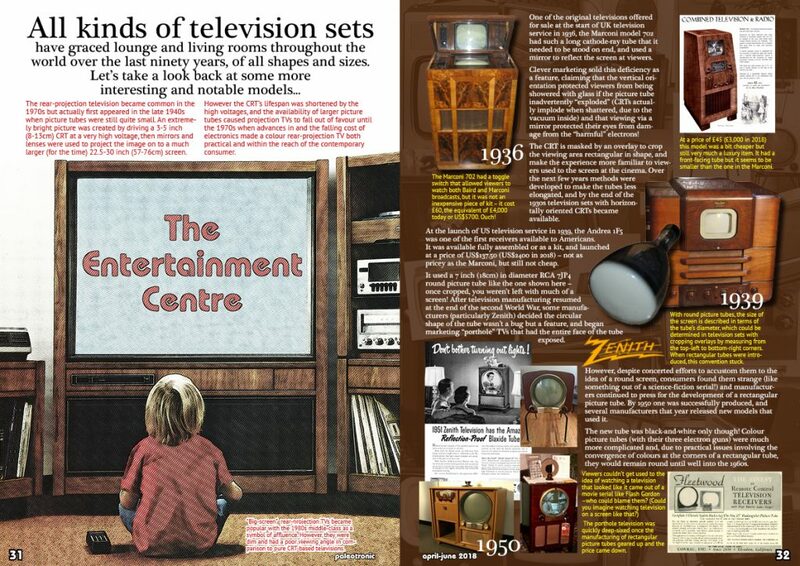 The rapidly falling cost of portable televisions soon meant the lounge room wasn’t the only place you could watch TV. Televisions became common fixtures in bedrooms, dens, kitchens and basement “rumpus rooms”, often relocated living-room sets, displaced by a newer model. Plastic replaced wood, and as the weight of the electronics inside the television set went down, the size of the CRT they powered went up. The lengths of the tubes became shorter while their faces became flatter, ever-more sophisticated electronic techniques making images crisper and more vibrant, the wood-grain finish vanishing to be replaced with simple black or silver, the intent for the television to also vanish from the mind of the viewer, leaving only the program they watched, immersing themselves in it. The 4:3 aspect ratio (the ratio of the width to the height) used by early cinema and then television screens would finally be replaced by the widescreen 16:9 aspect ratio, bringing an end to “pan-and-scan” movie conversions that often left out crucial details in scenes. This would prove to be the pinnacle of cathode-ray tube-based televisions, as other screen technologies such as plasma and then LCD displays romped on to the scene in the early 21st century, gradually pushing the venerable picture tube out through the bottom of the market, until it was gone. Most major manufacturers ended CRT TV production by 2012.